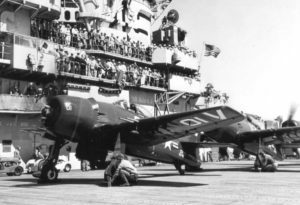 On October 4, 1945, Ensign Clinton S. Winter, Jr., took off from Quonset Point Naval Air Station in an F4U-4 Corsair, (Bu. No. 81380), for a routine training flight. Just after takeoff, while at an altitude of 200 feet, the engine suddenly lost all power and the plane crash-landed into Narragansett Bay about two miles off the end of the runway. The plane sank, but Ensign Winter escaped and was rescued a short time later. At the time of the accident, Ensign Winter was assigned to VBF-81. 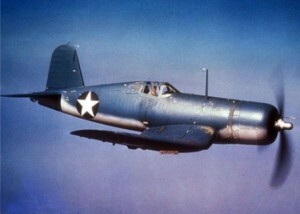 Source: National Archives, AAR 7-45, TD451004RI, via Larry Webster, Aviation Historian, Charlestown, R.I.